Women play an important role within small-scale fishing communities in the South Pacific, contributing to food security and income. Yet, decisions on the management of coastal fisheries are mostly taken by male community leaders. Given that women and men interact with marine spaces differently, there is a need to further analyze women’s and men’s differentiated roles and participation in marine resource use and governance. This study does so by drawing on qualitative data from a case study in Solomon Islands. In the fishing community studied here, women had crucial and differentiated effects on social, economic, and ecological sustainability. Our study reveals that women provided significant social and economic benefits to their families and the broader community. At the same time, we find that some women were inclined towards breaking local marine management rules (i.e., potentially lowering positive ecological effects of the conservation efforts) because (1) women had been little involved in the decision-making with regard to local marine management; (2) women had partly lost trust in the local male leadership due to a perceived misuse of money; and (3) women were more constrained in their fishing activities because a marine closure was located where mainly women used to fish. Our study highlights the importance of paying attention to women’s needs and actions in the governance of the fishery—including both the positive as well as potentially negative consequences thereof. Furthermore, our study shows that, besides gender, other socio-cultural variables (i.e., religious denomination and place of birth) shaped a person’s role and interactions in the fishery. It thus adds weight to intersectional approaches to gender. On a global scale, fisheries have for a long time been—and often continue to be—seen as a primarily male domain. This is partly due to the gendered division of labor in the fishing sector, wherein women in many parts of the world mostly occupy the pre- and post-harvest sector and are regularly less involved in the catching of fish (Bennett 2005; Choo et al. 2008). However, this masculine perspective of fisheries results from a narrow understanding of fishing, which often excludes predominantly female harvesting activities such as the collecting of invertebrates along shores (Schwerdtner-Máñez and Pauwelussen 2016). Due to the fact that women and men often use marine spaces differently (de la Torre-Castro et al. 2017; Kleiber et al. 2015), a gender lens is required to gain a deeper and more holistic understanding of human interactions in coastal-marine spaces. Thus, there is a need to further analyze women’s and men’s differentiated roles and participation in marine resource use and governance. In this article, we study these aspects in the context of a fishing community in the South Pacific (i.e., Solomon Islands). People in the South Pacific—a region characterized by rather small land masses and large surrounding oceans—are not only socially and culturally bound to the sea but also highly dependent on it for their livelihoods and food security. In some areas as much as 90% of the protein intake is derived from marine resources (Bell 2007). Women play an important role within fishing communities and households in the Pacific; through their active participation in fishing and the harvesting of marine invertebrates, women contribute essentially to food security and income. Traditionally, women have concentrated their harvesting activities on inshore areas and lagoons, using rather simple tools. Yet, their methods are sophisticated and require a profound knowledge of the ecosystem and species characteristics (Lambeth et al. 2001; Chapman 1987). Contrary to the conventional perception that women are less involved in capture fisheries, it has been found that women in the Pacific region account for 56% of the small-scale fisheries catches (Harper et al. 2013). For Melanesia,1 a comparative study found that women’s total annual catch corresponds to approximately 80% of the subsistence demand of communities (Kronen and Vunisea 2009). Similarly, in Solomon Islands, a recent study found that women contribute more than half of the subsistence catch and are increasingly fishing for income, too (Krushelnytska 2015). Nevertheless, women’s role in the coastal fisheries of the South Pacific often remains undervalued and less attention has been paid to managing resources that are harvested by women (Aswani and Weiant 2003). Moreover, as stated a few years ago by the director of fisheries of the Pacific Community,2 “[in] most Pacific Islands, decisions impacting on management and conservation of coastal fisheries are traditionally made by male community leaders, elders and chiefs with very little or no input from women” (Amos 2014:3). Throughout the Pacific, societies have developed and are continuing to practice diverse customary systems to govern social, political, and economic aspects of life (Zorn 2010). These customary systems also continue to provide the basis for currently practiced community-based marine resource management (CBMRM) efforts (Cinner and Aswani 2007; Aswani and Ruddle 2013). In Solomon Islands, although in some regions land titles descend through matrilineal lines, customary systems tend to be patriarchal. Women are often excluded from leadership roles and major decision-making (Corrin Care 2006; Corrin 2008). In this light, it becomes particularly relevant to understand how roles within the fishery and CBMRM systems differ between women and men and how this translates into different behavior. It is the aim of this paper to shed light upon these—currently understudied—issues as well as to discuss women’s effects on social, economic and ecological sustainability in the fishing community. Throughout the years, the theoretical discourse on women and gender aspects in (small-scale) fisheries has evolved from a focus on “women in fisheries” to “gender in fisheries,” addressing broader issues of equality and gendered (power) relations (e.g., Kleiber et al. 2017). In the context of gender and environmental governance, scholars have stressed the potential positive effects of women’s greater participation in management on conservation outcomes (e.g., Agarwal 2009). Gender refers to the culturally defined roles that women and men can take in social and political life, and usually determines which activities one can undertake and what rights one has (Ravera et al. 2016a). Gender is inherently connected to power relations and closely linked to cultural norms and traditions (see, e.g., Schwerdtner-Máñez and Pauwelussen 2016; Kleiber et al. 2017). More recently, feminist intersectional approaches have highlighted that various social, economic, and cultural characteristics (e.g., gender, class, age, ethnicity, education) intersect and hence shape social identities and behavior. These approaches acknowledge that gender roles are inherently intertwined with multiple characteristics and therefore shift away from viewing women as a static and homogenous group (Ravera et al. 2016a; Ravera et al. 2016b). Conceptualizations of intersectionality in the context of natural resources have emphasized that subjectivities are a result of multiple power-dynamics within socio-natural networks. This view highlights the role of nature in producing social differences, space, and ecologies, as well as the dynamic relationships between gender, the environment, and other social and cultural aspects of life (Nightingale 2006, 2011; Valentine 2007). Furthermore, intersectional approaches have questioned the binary view of male-female in gender approaches (Ravera et al. 2016a). In this light, it should be noted that transgender individuals and identities—for which a purely binary perspective on gender is not appropriate—have been common in many customary societies across the South Pacific (see, e.g., Jolly 2008). In this study, while the focus of analysis lies on women and gender, we also take into account other socio-cultural variables that might be intersecting and thus affecting certain roles and interactions. The Solomon Islands archipelago consists of more than 900 islands in the south-western Pacific. With approximately 600,000 inhabitants, it is the third most populous Pacific Island country. The population is heavily reliant on small-scale agriculture and fishing for subsistence and income—especially in rural areas, where more than 80% of the population lives (Solomon Islands National Statistics Office 2009). 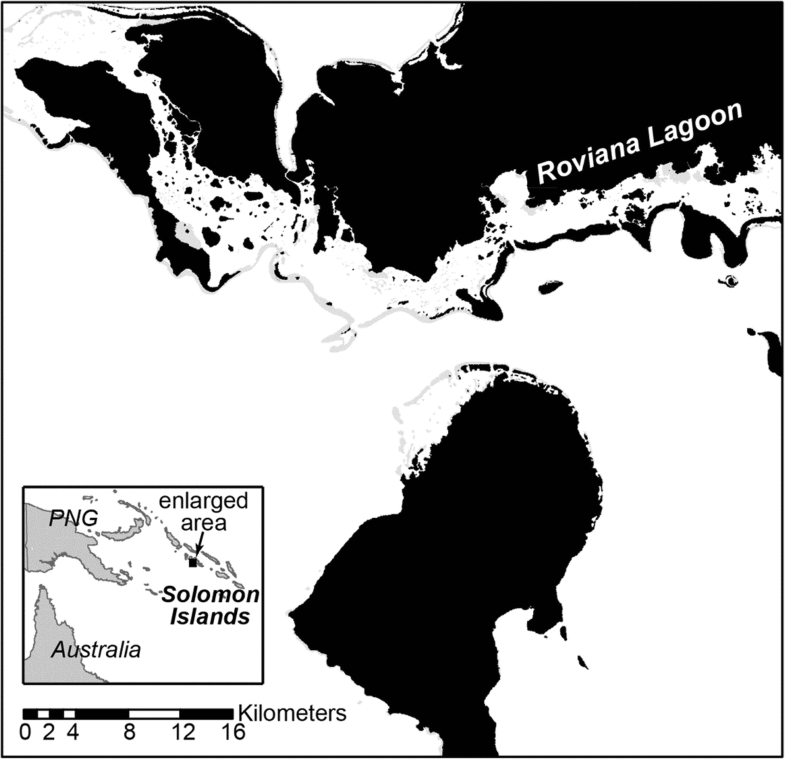 This research was conducted in a remote village in Roviana Lagoon in Western Province (Fig. 1), where approximately 1000 people live spread over three islets.3 Customary chiefs and elders decide upon access to and management of local marine resources in this area. A permanent marine closure, restricting all marine harvesting activities in front of the village, was set up in the late 1990s in the frame of a wider regional conservation and development program (see Aswani et al. 2007). The marine closure was managed by a community-based organization (CBO) and a local resource management committee, in close collaboration with local (customary and church) leadership. However, local marine management, and compliance therewith, weakened in recent years due to decreased levels of trust in leadership as well as leadership disputes related to a division of the local predominant church (see Rohe et al. 2017). We collected data between April and June 2015. We employed semi-structured (n = 18) interviews with female and male villagers, key-informant (n = 2) interviews, focus groups (n = 2), and participant observations. We aimed for a gender balance within the group of research participants. Hence, we interviewed eight female and ten male villagers.4 Key informants were one male and one female each; the former was engaged in the CBO for managing the marine closure, the latter in the local women’s group. Interview questions inquired about the respondent’s fishing and other livelihood activities, local marine resource management, perceptions of its purpose and benefits, issues regarding local decision-making, and peoples’ participation in it. Further questions sought to elicit an understanding of local compliance dynamics regarding the local marine management, as well as drivers of non-compliant behavior (see Rohe et al. 2017). Interview respondents were selected purposively based on contextual variables that were developed in an iterative process throughout interviews. In this process, various potentially relevant respondent characteristics, i.e., gender, age, religious denomination, marine resource use, and involvement in local decision-making (and the CBO), were taken into account. Focus groups were guided by similar questions and themes that were touched upon in the individual interviews, though in a more interactive and collective way (Mancini Billson 2006). Because gender was the focus of analysis of this study, we conducted one focus group with women and one with men, each with seven participants. The majority of focus group discussants was involved in fishing and represented a range in age, as well as different religious denominations. Interviews and focus groups were conducted in the local language (Roviana), with the help of a local interpreter. All respondents provided prior verbal informed consent. Data from interviews and focus groups were digitally recorded and transcribed. Qualitative data analysis software (MAXQDA) was used for the inductive analysis of the data, i.e., to identify and relate emerging themes and patterns. Overall, we found that women were intensively involved in the extraction of marine resources. This way, they contributed essentially to food security as well as, more and more, to income within households. Additionally, women made contributions to communal and church activities by organizing market days in the village during which they sold prepared (smoked) fish while the earnings would be given to the church. Overall, most women expressed that they, as women, had little influence on local decision-making and no representation within the council of elders, the customary institution that had the final say on many decisions regarding village life, as well as marine resource use and management. The local marine management initiative was implemented and managed by a CBO and a local resource management committee. It was reported throughout interviews that women had been far less involved in both these institutions than men. Also, rangers who were appointed to monitor the marine closure were solely male. The same applied for “trustees,” i.e., tribal or community representatives who were appointed to negotiate logging agreements for the land that was customarily owned by villagers. Trustees received royalty payments from the logging company (in compensation for the logging) to be distributed within the village. Many villagers, both women and men, perceived that this process lacked transparency and that the money was not spread equally. It further became apparent that, apart from gender, the place of birth and thus people’s tribal identity influenced to what extent they could participate in local decision-making. Both male and female respondents who had migrated into the village due to marriage stated that they felt they had no influence on decisions within the village, including with regard to marine resource use and management. An older fisherman stated: “[I] cannot influence these decisions [on the fishing areas] because [I am] from a different province.” The exception was an older male who was originally from another province but who, due to the fact that he was a pastor, felt that he was respected by the customary leadership and was invited to their meetings. This shows that some variables (i.e., member of religious leadership) can outweigh other aspects that could usually limit a person’s capacity to influence decision-making (i.e., being born outside the community). Despite limited involvement in decision-making, many of the women were actively involved in the women’s group of the church. Within the church group women engaged in joint gardening, preparations for important communal events (e.g., during Christmas), as well as spiritual meetings. Moreover, several women had jointly raised money to set up and run a little shop—the only place where people could buy basic food items within the village. However, engagement in the women’s group partly depended on religious affiliation. Since the division of the local predominant church, members of the religious minority group (locally referred to as “B group”) had been excluded from participating. Hence, women from the “B group” had a dual burden and experienced exclusion not only from decision-making processes but also from communal activities. Additionally, (female and some male) respondents revealed that the marine closure was located in an area where mainly women used to fish before due to its close proximity to the village. Women were thus more constrained in their fishing activities given their multiple responsibilities in the household and involvement with child care, which hindered them from spending long hours fishing or going to more distant fishing grounds. This was given as an additional reason for why women were increasingly fishing inside the conservation area. In face of dissatisfaction with the management of the marine closure, some women had come up with the idea to create a “women’s marine protected area” (MPA). This MPA would be applicable to everyone but managed solely by women. The idea had been proposed to the leaders within the council of elders—who were initially supportive. However, after the schism, the idea did not proceed any further due to an overall weakening of leadership, i.e., a lack of legitimate authority to decide upon further steps. Women’s role and involvement in fisheries, as well as their contribution to economic and societal benefits, have often been overlooked and undervalued (e.g., Chuenpagdee et al. 2006; Harper et al. 2013). In the fishing community studied here, women had crucial and differentiated effects on social, economic, and ecological sustainability. By their active involvement in fishing, both from canoes within the lagoon as well as harvesting invertebrates along shores, women played an important role within the fishery. Their marine resource extraction made a main contribution to the nutrition of their families. Besides, many women’s fishing activities were increasingly generating an income through the sale of fish to middlemen. We further found that women’s fishing activities were serving communal and church events as well as central family functions (e.g., meals on Sundays). It can thus be argued that women provided considerable social and economic benefits to their families and the broader community—or, in other words, women added substantially to the social and economic sustainability of the community. Our case study reveals that some women were inclined towards breaking local marine management rules because they were dissatisfied with how management had been conducted and because they—due to a perceived misuse of money—had partly lost trust in male leadership. An additional reason for some women’s non-compliance with the marine closure was the fact that women were more constrained in their fishing activities (i.e., they were bearing a higher burden), because the marine closure was located in an area where mainly women used to fish. Adding to this, a recent study found that the installation of fish aggregating devices across Solomon Islands, including within our study area, increased the amount of time spent fishing by male fishers. Consequently, husbands were found to have less time to support household and community activities—which further augmented the burden for women (Albert et al. 2014). Generally, women in our study had to large extents been excluded from the decision-making and implementation of local marine management. This shows that roles within local marine management differed between women and men and that, due to the location of the marine area, they were also affected differently in their fishing activities. Given that non-compliance can undermine conservation outcomes and affect the ecological performance of protected areas (Pollnac et al. 2010; Campbell et al. 2012), some women’s (and other people’s) fishing activities inside the marine closure (see Rohe et al. 2017) had the potential to lower environmental sustainability within our case study site. At the same time, the management rules in place should be questioned when they turn out not to be socially just and equitable (i.e., through imbalanced impacts on women), despite their ecological meaningfulness. Cases of MPAs with positive biological outcomes, but with less desirable social effects, have been documented by other studies (e.g., Christie 2004). Overall, this demonstrates the importance of paying attention to women’s needs and actions in the fishery—including both the positive as well as negative consequences thereof. So far, these have often been overlooked or remain underdocumented (e.g., Chuenpagdee et al. 2006). Yet, in the late 1990s a joint development and conservation project with a focus on women was set up in Roviana Lagoon. The project established temporal closures for shell harvests in two mangrove areas in combination with a sewing project for generating a small income for women (see Aswani and Weiant 2003). Thus, the project’s aim was to address predominantly female needs. It can therefore serve as an example where female harvesting activities, as well as ensured sustainability of the resources harvested by women, were of primary concern. Moreover, women’s local ecological knowledge was key for the marine management interventions. This way, women played a crucial role in designing and designating the shell closures and in turn contributed to, and potentially benefitted from, the sustainable resource use and management. As mentioned before, and found similarly in other studies from the South Pacific region (e.g., Kruijssen et al. 2013; Amos 2014; Cohen et al. 2016), women in our study were generally constrained in their ability to impact decisions (including on local marine management), because decision-making tended to rest with male leaders. Still, women showed to be proactive and innovative, too, which is demonstrated by the village shop initiative as well as the idea to create a women’s MPA. Thus, our study resonates with insights from research on global environmental change and gender, where women—despite their vulnerability towards environmental changes—have been found to be increasingly proactive in developing individual and collective innovative strategies to deal with these changes (Ravera et al. 2016a). Although gender was revealed to be a crucial determinant, various other socio-cultural variables seemed to determine a person’s capacity to influence local decision-making (including on marine resource use and management), as well as to engage in village groups. These other factors were place of birth (for persons who had married into the village) and religious denomination (due to the division of the local predominant church). For instance, it showed that women from the religious minority group experienced a “dual exclusion” (i.e., from decision-making and the women’s group). These findings add weight to intersectional studies on gender (e.g., Nightingale 2011; Ravera et al. 2016a; Ravera et al. 2016b), which have argued that different axes of experience and identity shape a person’s everyday life as well as interactions with natural resources. In order to achieve more socially inclusive as well as ecologically sustainable outcomes in the conservation and use of marine resources, it is vital to understand differentiated roles and participation in marine resource use and management. In this study, we find that patterns with regard to participation in decision-making and local marine management—and partly, as a result thereof, behavior towards management—were gendered. This can in large parts be attributed to the customary systems and traditions in Solomon Islands, which vest more power in men and male leaders (Corrin 2008). Overall, there is growing recognition of the importance of gender equality with regard to achieving sustainable livelihoods from coastal ecosystems (e.g., Weeratunge et al. 2012), as well as the need for equal gender participation in fisheries governance (e.g., Kleiber et al. 2017). Our study adds evidence to that by revealing that some women expressed their discontent with male leadership (and unfair rules) through non-compliance with the marine closure. However, it would be wrong to assume that gender equality and women’s emancipation are universally accepted goals (Bennett 2005). Especially in a setting where (patriarchal) customary systems continue to lay the basis for community-based marine resource management (Cinner and Aswani 2007), as it is the case here, this needs to be kept in mind. Therefore, there has been a move towards gender transformative approaches in recent years. Such approaches employ participatory processes (e.g., through longer-term collaboration between communities and non-governmental or research organizations) that aim at a critical reflection of social norms and power relations within local communities in order to rethink and change gendered practices and (social/customary) institutions (Cole et al. 2014). Recently, Pacific Island governments (including Solomon Islands) launched the Pacific Platform for Action for Gender Equality and Women’s Human Rights as a “a roadmap for accelerating achievement of gender equality and enhancing the well-being of women and girls” (Pacific Community 2017:3). The roadmap, inter alia, identifies social and cultural norms as barriers to gender equality in the region. It indicates high level recognition of the importance of addressing gender equality, e.g., by ensuring women’s participation in leadership. Still, how this roadmap will be implemented at the national level and whether this will lead to changes locally, e.g., in fishing communities, remains uncertain. Finally, evidence from our study of the non-compliant behavior of some women towards the marine closure—in parts related to its location—provide important insights for fisheries governance and community-based marine resource management. It highlights the need to take into account women’s fishing activities, e.g., including where they harvest resources, in order to avoid that spatial management tools, such as the marine closure in our case study, put a higher burden on women. Additionally, our study shows that excluding women, i.e., a major resource user group, from the decision-making on and implementation of management efforts can lower their acceptance and compliance therewith (especially when leadership is weakened). This then has the potential to undermine social and ecological benefits of local marine management. In other words, an improved involvement of women in local marine governance could help to increase social and ecological outcomes. Melanesia is a subregion of the South Pacific, comprising Vanuatu, Solomon Islands, Fiji, Papua New Guinea, Eastern Indonesia, and New Caledonia. Due to confidentiality agreements with research participants the name of the village will not be disclosed. A completely balanced sample of male and female respondents was not feasible because we also wanted to interview persons involved in local decision-making, which inherently implied more men than women. We are very grateful to the people of the community we worked in for their support and participation in this research. We also thank the local field assistants and interpreter who helped to facilitate research on the ground. We further wish to express our thanks to diverse stakeholders, including the Government of Solomon Islands, for the kind collaboration. We are also grateful for the insightful comments of two anonymous reviewers on a previous version of this paper. This work is part of the REPICORE project (grant 01LN1303A), funded by the German Ministry for Research and Education (BMBF) in the frame of the “Research for Sustainable Development Framework Program” (FONA), and contributes to the ICSU and UNESCO-sponsored “Program on Ecosystem Change and Society” (PECS). The first author conducted the field research and data analysis and wrote the initial manuscript. The two co-authors accompanied the overall research project and contributed to this manuscript by providing analytical and theoretical input. Chuenpagdee, Ratana, Lisa Liguori, Maria L.D. Palomares, and Daniel Pauly. 2006. Bottom-up, global estimates of small-scale marine fisheries catches. Fisheries Centre Research Reports 14. https://doi.org/10.14288/1.0074761. Rohe, Janne R., Shankar Aswani, Achim Schlüter, and Sebastian C.A. Ferse. 2017. Multiple drivers of local (non-) compliance in community-based marine resource management: case studies from the South Pacific. Front Mar Sci 4. https://doi.org/10.3389/fmars.2017.00172.